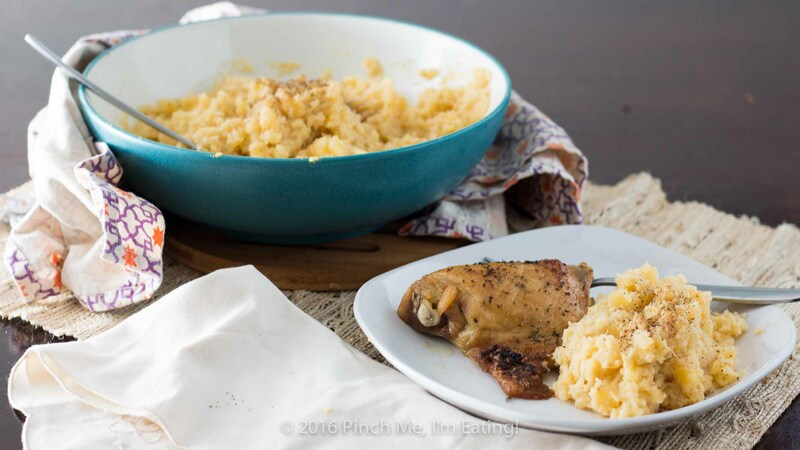 Mashed Rutabaga with Nutmeg | Pinch me, I'm eating! 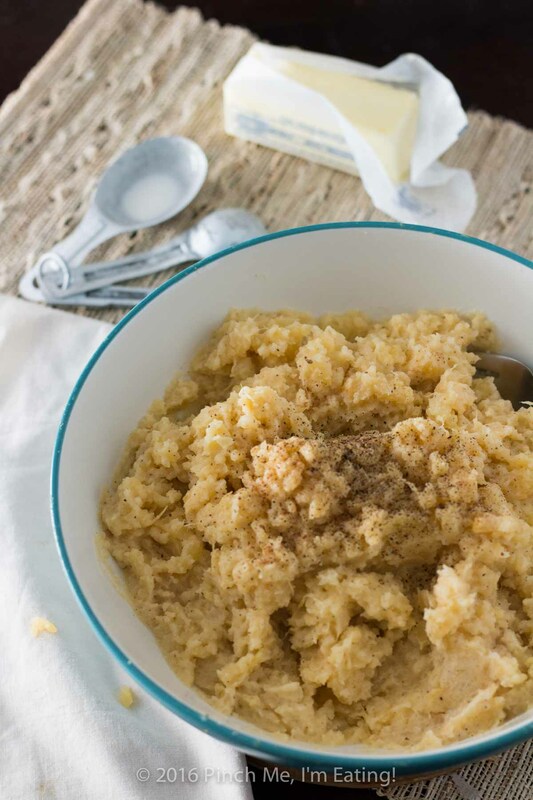 Mashed rutabaga is a delicious, naturally sweet low-carb Thanksgiving side dish made even better with a little nutmeg. 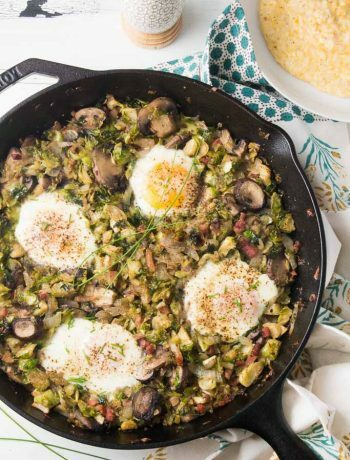 You won’t want to go back to potatoes! I mentioned going to our awesome new West Ashley Farmer’s Market last week when I got the persimmons. Well, this week they didn’t have persimmons (so sad! ), but I did get a couple of nice looking rutabagas at the market. In the past, rutabagas were something I would have passed by at the grocery store without a second thought, not knowing what they were or how to use them. Turns out rutabagas, sometimes known as wax turnips, are members of the Brassica family. 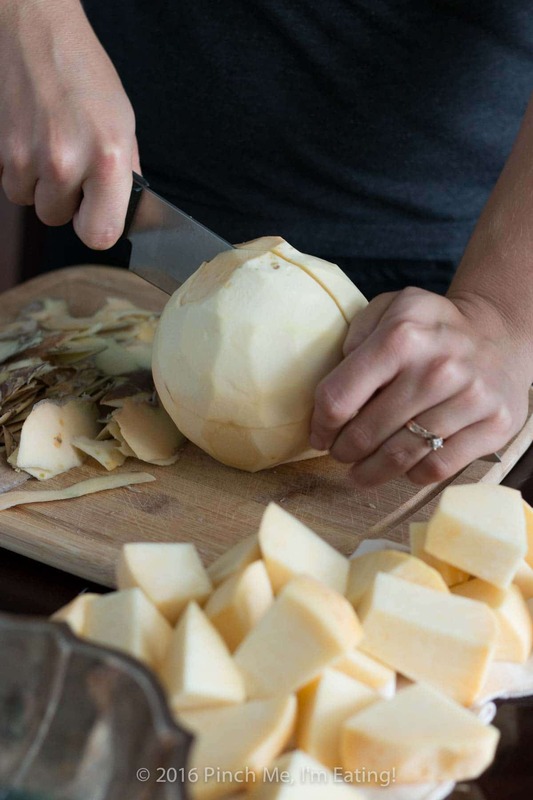 The Brassica family includes turnips, but a rutabaga is sort of a cross between a turnip and a cabbage. Weird, right? 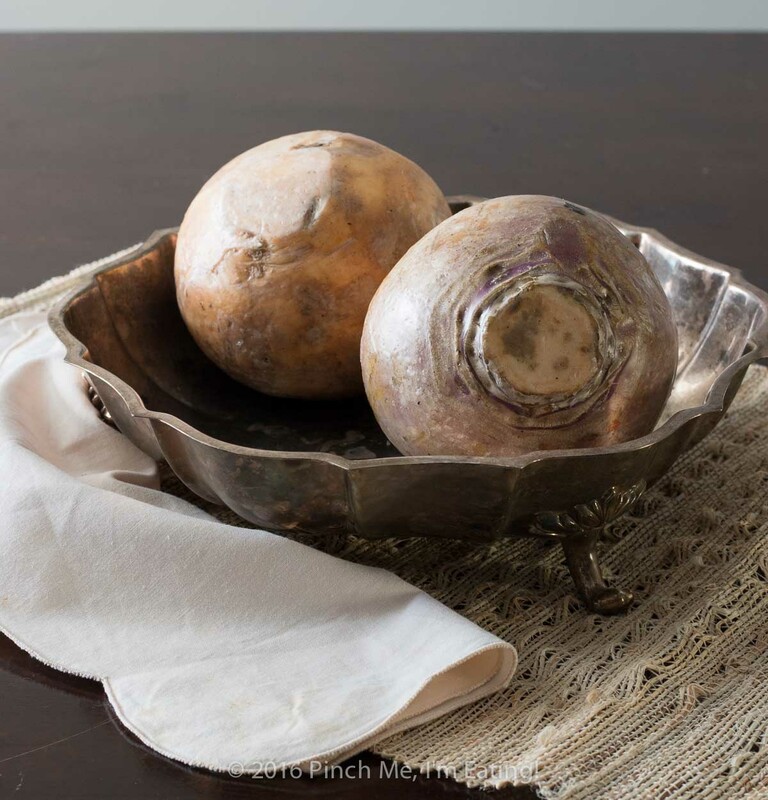 Rutabagas are root vegetables, and, as you might have guessed from their nickname, are usually covered in a thin layer of wax to keep them from drying out after being harvested. Now, I didn’t know most of this stuff until just now, because all I really needed to know was they’re freaking delicious. I think we were at my mom’s house for Thanksgiving, or maybe we were at my sister’s in-laws’ house for a get-together. What I do remember is a table full of good food and a house full of family. I served myself some of everything, including a spoonful of what looked like yellow mashed potatoes. It tasted sort of like a hybrid of mashed potatoes and something like butternut squash. The texture was less starchy than mashed potatoes, and it had kind of a natural sweetness to it. After tasting it, I had to know who made it and what it was. Turns out my sister’s mother-in-law, an excellent cook, had brought the dish. And, as you might have guessed, it was mashed rutabaga. Since then it’s been one of my favorite side dishes. 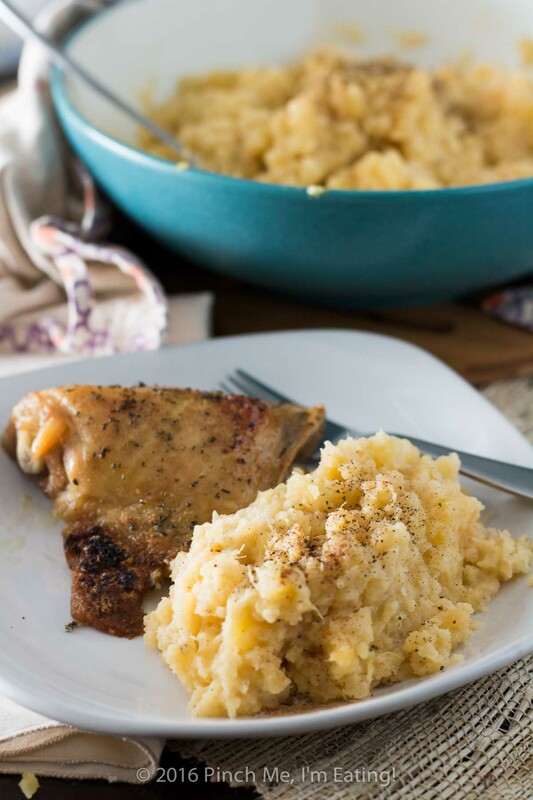 Mashed rutabaga is pretty easy to make and similar to how you’d make mashed potatoes. Peel it, chop it up, boil it, and mash it with some good stuff. Voila! What you should know is, in my experience, rutabagas are VERY hard to cut through. There have been several times I’ve gotten halfway through the vegetable and been nearly unable to either finish the cut or extract my knife to try again. My recommendation to help avoid that situation is to get a couple smaller rutabagas instead of one large one. It can still be difficult to cut through, but it’s much easier than trying to cut a big one. I add in some butter and cream to my mashed rutabaga, along with a little nutmeg to complement the natural sweetness. If you’d like, you can add in a bit of brown sugar, but it’s not necessary. 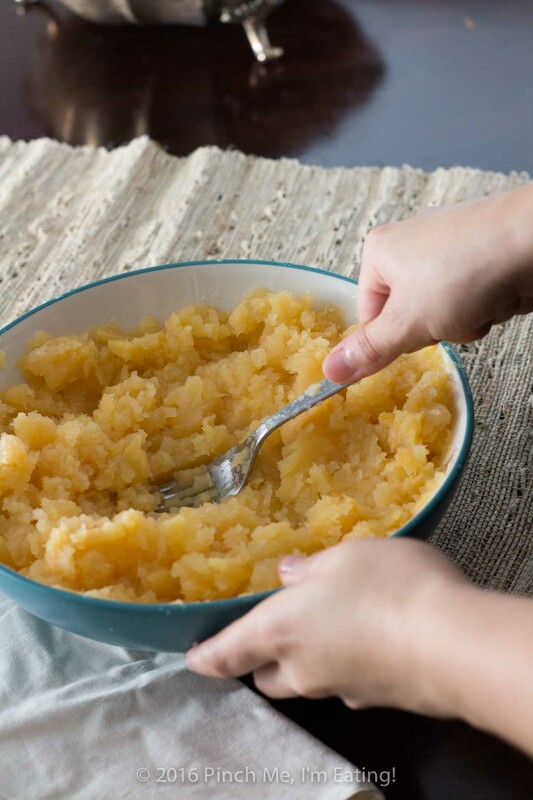 As an added bonus, mashed rutabaga has about a third of the carbs and less than half the calories as the same amount of mashed potato, so it’s a great low-carb mashed potato alternative side dish for Thanksgiving, if that’s your bag. 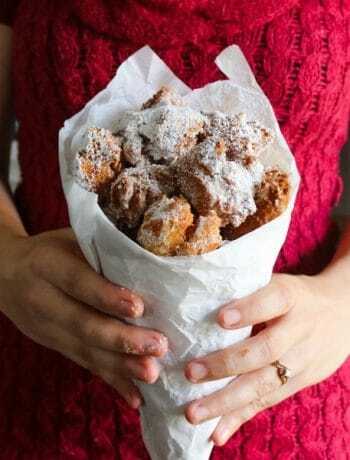 If low-carb isn’t your thing, you should still make these just because they’re delicious and are probably a changeup from your usual dishes! As a nice hearty side dish, they’re also great alongside some baked chicken or with a little gravy on top. 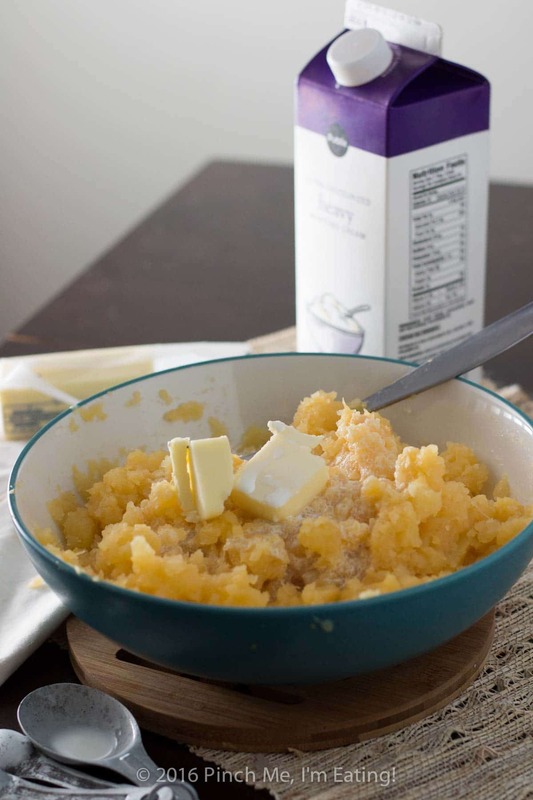 So you definitely do not have to wait until Thanksgiving to enjoy some creamy mashed rutabaga! Yummm! What are you planning to make for Thanksgiving this year? 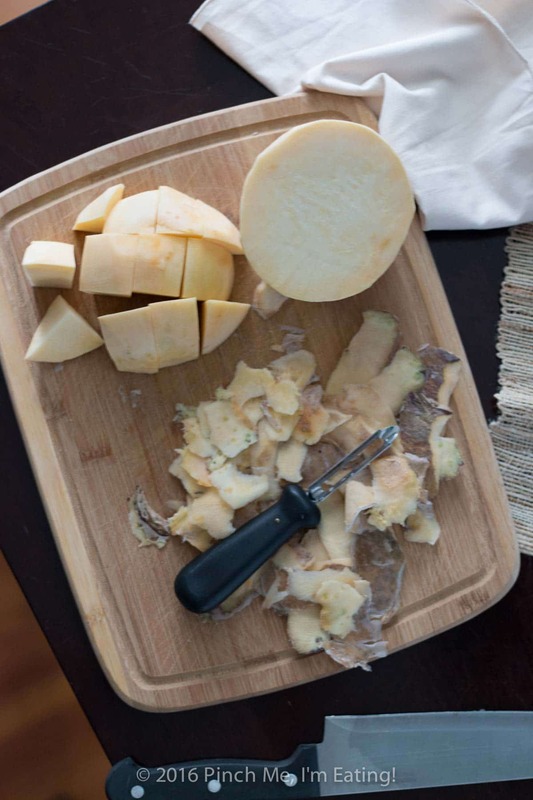 Have you ever had a rutabaga? Let me know in the comments! 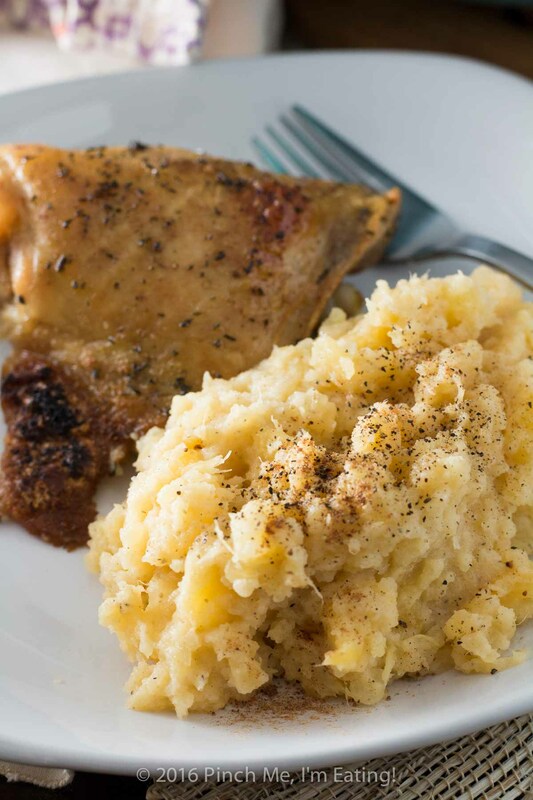 Mashed rutabaga is a delicious, naturally sweet low-carb Thanksgiving side dish made even better with a little nutmeg. You won't want to go back to potatoes! 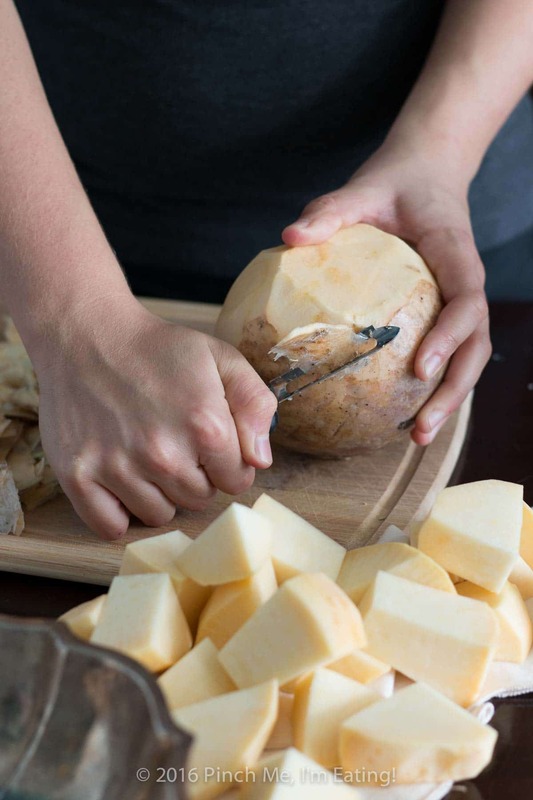 Peel and roughly chop rutabagas. Bring large pot of salted water to a boil and add chopped rutabagas. Boil for 30-45 minutes or until fork tender. Drain and return to pot or large bowl. Mix with cream, butter, salt, pepper, and nutmeg, and mash with a fork or potato masher until it reaches the desired consistency. Taste and add brown sugar, if desired. Serve with baked chicken or as a Thanksgiving side dish, plain or topped with gravy. Enjoy! Rutabagas are very hard to cut through, so get a couple smaller vegetables rather than one large one to make it easier on yourself! Thanks for your feedback, David! I didn’t realize I made so much Southern food but I guess I do. Pulled pork, collards, more okra, cornbread – those may be coming your way! Great video! Few people enjoy or have even heard of rutabaga. 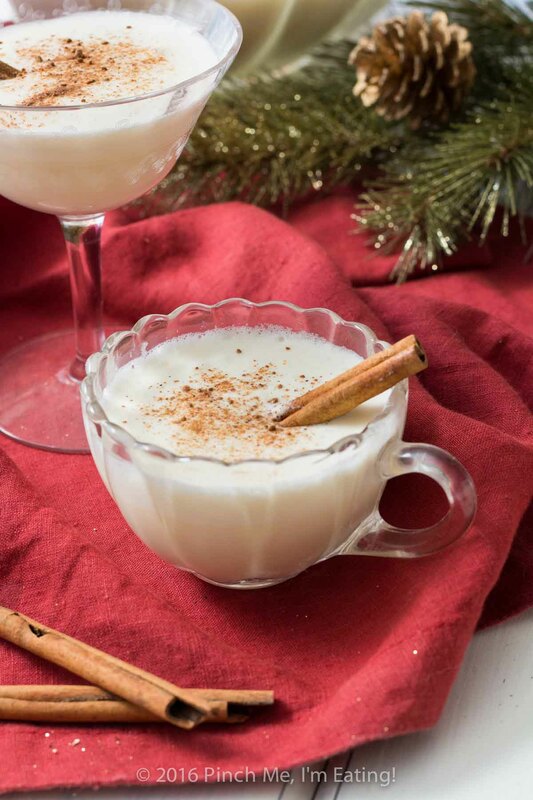 Your video illustrates exactly how it should be made znd what defines the holidays for me…..never had the nutmeg touch and,am gonna try it today! Thanks, John! 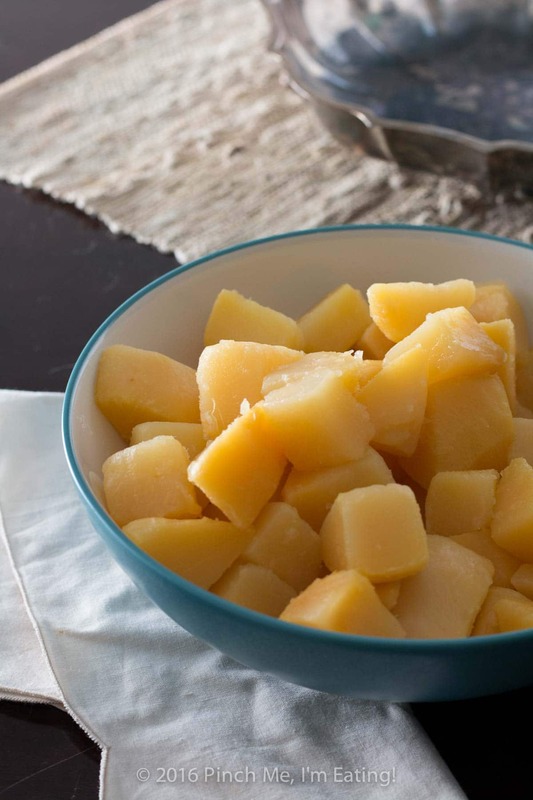 I hadn’t ever had rutabaga myself until a few years ago, but it’s one of my favorites now! I hope you liked it with the nutmeg. Happy Thanksgiving!